Visual Visitor is a sales and marketing tool with an amazing feature set that helps companies reach their goals – from the anonymous website visitor (via inbound marketing) through customer retention. 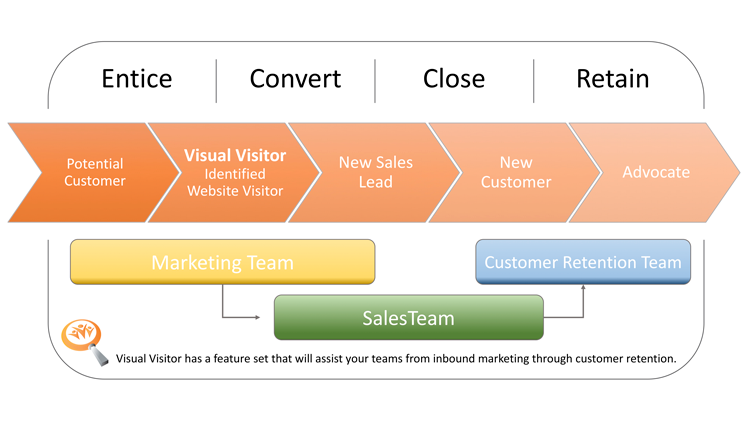 Some of you might be wondering how Visual Visitor can help you achieve your Inbound Marketing goals. First off, inbound marketing can be defined simply as a type of marketing technique where you market in ways that allow customers to search for you instead of you searching for them. Think about those blog posts you have your marketing team writing. You are writing about your product, the need for your product, using tags to make your posts searchable, etc. People search on topics, read those posts, and realize, wait, I need something that does that. Bam. They are looking for you. Or your social media posts, reposts, etc. You are trying to attract customers that will search out your products. **Inbound marketing differs from outbound marketing in that you are creating content that is by design, intended to attract potential prospects. This content is written to define the customer’s issues, provide solutions, all while building trust and credibility for your business. Now that you have achieved your goal of attracting anonymous visitors to your website, Visual Visitor steps in and identifies those visitors for you! After you have worked so hard to attract those visitors to your site, without a tool like Visual Visitor in your arsenal, you will miss them! We not only identify those visitors, we are with you throughout the sales cycle as well. With features like Identify ANYONE (email campaign tracking) to assist in inbound marketing goals, you then have our Forms Capture to tie in to any existing forms you have on your site, an analytics package to help understand where those visitors are coming from, Email Tracking to tell you what happens after you click send on those follow up emails, and so much more! We even have the ability to integrate with multiple web applications via Zapier!!! *** With our 14 day free trial, increasing your Inbound Marketing return with Visual Visitor is a MUST!! !